This book, written in English and Spanish, depicts Sonia Sotomayor, a Supreme Court Judge, facing classism, sexism, racism, and ableism from childhood throughout adulthood, but it does not stop her from following her dreams. 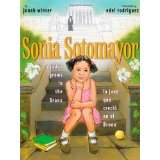 This modest story follows Sonia as she starts as a poor inner city child with only her single mother to look up to, and blooms into the first Hispanic (third female) to hold a seat on the Supreme Court. Sonia is a child raised by a single mother, living in a low income area, who works very hard to provide Sonia with all of the love and support she needs to succeed. Her original dream was to be detective, but a diagnosis of diabetes during her childhood shatters the idea of solving mysteries, but redirects her attention to becoming a judge. Hard work and dedication finally earns her a seat on the Supreme Court, but she is still tackling obstacles when she is accused of being racist herself. In the classroom this book can be used to introduce an "All About Me" report. They will be asked to fill out a sheet with questions about who they are, where they come from, dreams, and aspirations ,etc. Students then will draw a picture book, create a short story, or create a project (depending on grade level) that will indicate what they think they need to do in order reach those dreams. For a higher grade level, they can write a persuasive letter (the how's and why's) to themselves in the future to encourage them to keep working hard toward their dreams. Here they will explore the resources in their lives i.e. family, friends, neighbors, teams, groups, etc. This will hopefully give them an understanding of the many choices they have, and how to capitalize on them in order to achieve their goals. It will also build appreciation for who and what they have in their lives.